Somehow, the items of the twelve days of Christmas have gotten scattered. Help Santa round them up and gather other needed items. 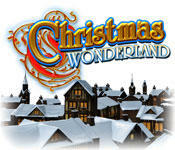 Christmas Wonderland is a hidden object game with other mini-games. On the hidden object screens, you must find the items listed at the bottom. Each time you find a twelve days of Christmas item, it will be placed on the top menu. When you find all of the number of a particular twelve days item, that part of the song will be sang. In addition to hidden object areas, there are mini-games like spot the difference, put together a puzzle, Memory-type games, etc. The twelve days items are never found here and, after a certain length of time, the mini-games can be skipped.